Click Super Bowl 52 for behind-the-scenes coverage of what has become the most significant game in Philadelphia Eagles’ ‘history! We were part of history while in Minnesota for Super Bowl 52. F3TV: CLICK HERE FOR BEHIND-THE-SCENES AT #SB50, FAN INTERVIEWS & MORE! Female Football Frenzy, or F3 is a multi-media platform that uses the voice of women, and her interests – football, fashion, & philanthropy – to impact the charitable community. We are football mavens, fashionistas, and philanthropists bringing you all of your favorite things! We’re on the sidelines, online, and worldwide. Football mavens from across the US contribute to our many platforms while bringing you all you need to know about your favorite team’s favorite team; from Philadelphia to New York; Atlanta to Los Angeles we have weekly predictions, commentary, Fantasy Updates, and #WhatToWear…all necessary for the ideal NFL Season for the fashionable football maven. The inception of F3 was in 2011 when Founder, Tashyra Ayers was serving in one of her many roles as a radio personality at Philadelphia’s WURD 900AM. As the entertainment news reporter and host of her namesake pop-culture talk show, “The Tashyra Ayers Show” (Infotainment for life; for style; for YOU), Tashyra was able to infuse her personal style and love for all things football, fashion, and philanthropy into her broadcasts. Professionally, not only is Tashyra a radio personality, but she is also a 15-year corporate Public Relations (PR) professional having served in various capacities that influenced communities through business development, health care PR, and organizing nationally-recognized charitable events that included GRAMMY Award-winning artists such as Mary Mary, Israel Houghton, and Kirk Franklin. Tashyra’s professional passions, personal loves, and always-noted sense of style came to a head when she recognized that media and her platform in radio was the opportunity to use those things she lived for, to influence a broader spectrum of people. So, in 2011 a star was born. F3 started as a female-driven watch-party used to bring awareness and raise funds for health-related causes during Monday Night Football games. It was used to gather women (men were invited) from all walks of life that loved the gridiron, fashion, and the opportunity to give back to charity. F3 has supported organizations including Autism Speaks and the American Heart Association through our events, and has raised thousands of dollars for research (see ‘Philanthropy’ section for dollars raised). F3 has morphed into a multi-media platform that uses the voice of women, and her interests – football, fashion, philanthropy – to impact charitable communities across the country. F3 gathers professional NFL players to serve as advocates and voices behind our annual events. The players actually host the parties for the ladies! F3Philly is held annual in Philadelphia. Since F3 is mobilized, it will be coming to a City near YOU! F3NYC was a hit, and we look forward to F3Cali for Super Bowl 50 in February! Between annual events, we are active on social media through our Instagram, Twitter, and Facebook accounts providing in-depth information about the worlds of football, fashion, and philanthropy. We use social media to bring much-needed awareness, all year long, to causes that are close to F3 including childhood diseases, professional development, and the support of women in sports and media. We do so through online fundraising, and auctioning of customized, on-of-a-kind F3 apparel (More TBA). Newly launched, F3TV and our Periscope channel @frenzy03 keeps us up-close and personal with our followers. We keep them connected to their favorite players and fashionistas, while bringing exclusive looks into events hosted by NFL players across the country. Now, we all know the saying “If it don’t make dollars, it don’t make sense (cents)!” Well hunty, we’re here to express our 100% support of the NFL – this marketing move clearly makes dollars AND cents! The high-end fashion industry clearly agrees as their runways are influenced more and more with the jersey number and iconic sleeve stripe for NYFW and LFY 2014. Fashion continues to influence and be influenced by the ever-changing, forward-thinking forces that live and breath in the Earth. The creative forces who invent bodies of work in music and clothing understand the importance of bringing together their entities for a common purpose to reach a common goal. The female football fan, or football maven as F3 calls them is also the wearer of Givenchy and attends London Fashion Week annually. She is the kind-hearted fashionista who gives back to her community yet decides whether to have mild or hot buffalo wings (or both) for Super Bowl 50. She flawlessly prepares the wings in her custom Marchesa or Kristin Cavalleri jersey-dress. Our world will evolve. But it is the elegance of a stylish fashionista and football maven that will remain priceless! Thank you again for your words of encouragement. A good tool for fundraising is http://www.gofundme.com or .org. It’s an online fundraising tool that you can share with all our social networks; email blasts to friends and family, etc. We started a page for #F3 during our Super Bowl event to benefit the American Heart Assocation. Connections, I also appreciate your presentation and ability to impact a audience such as fredh oil who really needs help get people recycled into life. Thank you for your kind comment and support! 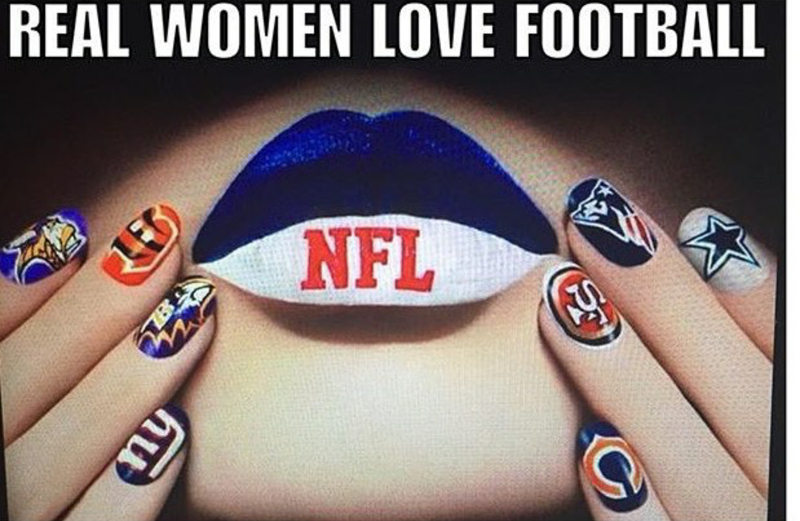 Please stay connected with us on Twitter @Frenzy03 and on IG @femalefootballfrenzy, and we will do the same with you!